My wife is a bit of a Disney fanatic. I've known this from the day we were married, and if I didn't know it then it was hard to miss on the day as she walked down the aisle to a song from the Lion King. Now to a lot of people, this obsession with all things Disney might seem a little weird, but I've found that it comes in handy. Let's take romance for example. I'm not super creative when it comes to matters of the heart, but with Lori, I don't have to be. Whenever I need a few more points in the romance category, I just steal an idea from a Disney movie. It's not going to send my creativity score through the roof, but we all know that romance outranks creativity on the Woman's List of Desirable Traits in a Man. Unless they've changed the list again. It's not like they tell me when they do. So last night was date night, and I decided that my romantic ranking could use some improving. The question though, is which movie to steal the idea from. I considered Cinderella, but pumpkins are out of season right now, and even if I could find one I don't have access to a Fairy Godmother. Toy Story had some cute moments, but I never really figured out that whole Woody/Buzz/Jessie/Bo Peep love quadrilateral. 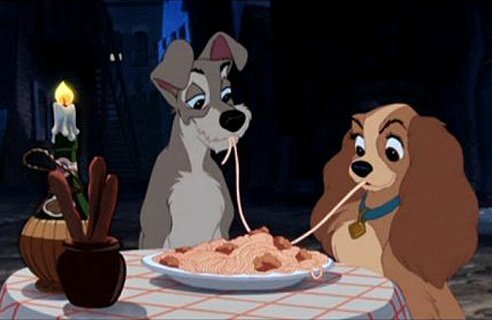 No, when it comes to romantic Disney moments, there's really only one that stands out above all others - the Italian dining scene from Lady and the Tramp, and I had the perfect plan. Kelowna recently got it's very own Old Spaghetti Factory. It's the 13th location for this B.C. based chain, and it seemed like the perfect place to re-enact the romantic dinner from Lady and the Tramp. I had visions of Lori and I snuggled in a corner table, candlelight flickering, and sharing a plate of spaghetti and meatballs. I highly doubted that an accordion player would be available, although how cool would that have been, but even without somebody singing "This is the night.." to us, you'd think that there wouldn't be too much I could do to mess this up. We all know better than that though don't we. When I say that Kelowna "recently got" an Old Spaghetti Factory, I mean it opened about ten days ago. New things are popular where I live, and we arrived at 8pm to be told that it would be about a 35-50 minute wait (It was 40. Points for accuracy.) for a table. Waiting isn't really romantic, and I considered adopting Tramp's technique of just barking loudly until I got what I wanted, but I figured that might not go over too well in this situation. Besides, any time spent with my baby is good time, so we settled in for the wait. You know what really adds to a romantic evening? Bringing your kids. Our oldest daughter was at a birthday party that was supposed to end at 9:30 which we figured would give us plenty of time to have dinner before picking her up. The party ended early however, and when you pair that with the wait for a table, it meant that my daughter got dropped off at the restaurant just as we got seated. OK, that was going to make the romance a little tougher, but maybe she could play the accordion or something. There's probably an app on her iPod for that. This could still work. When you order a meal at the Old Spaghetti Factory, it comes with Bread, Soup or Salad, and Ice Cream. Of course when I say "comes with", I don't necessarily mean at different times. Our bread, appetizer, and main course all came within five minutes of ordering. Sure, the first two entrees weren't actually the ones we ordered, but we were still two courses behind, and our server realized the mistake before we did. By the time we'd gotten through our soup, the corrected order had made it's way to the table with perfect timing. #1 - Don't tell your wife in advance that you're taking her out for dinner. I did this, so my wife didn't eat all day. She was starving by the time we were seated thus eliminating any chance of us sharing a plate of pasta. The odds of ending in a kiss when you're both eating pasta from separate plates, are slim. #2 - If you are sharing a plate of pasta, don't order sauce. In the movie the sauce splatters all over the place when the dogs are eating the pasta, but then it magically disappears. It works very differently in real life. #3 - If your plan is to re-enact the meatball sharing scene from Lady and the Tramp, actually order a dish that includes meatballs. I forgot this, and was left facing the prospect of rolling a mushroom over to my wife with my nose. It didn't seem like a winning idea. #4 - If all other romantic plans fall apart, order an extra piece of cheesecake for dessert. That pretty much fixes everything. You know what you don't see in Lady and the Tramp? You never see Tramp having to look at the bill. In the movie it's "Ona da house! ", but in real life, you have to pay for your attempts at romance. Fortunately, at the Old Spaghetti Factory, you don't have to pay too much. Our bill was $42 for bread, drinks, appetizers, entrees and ice cream for three people, plus an extra piece of cheesecake. That's a pretty good deal, and it pointed out to me that while my evening might not have gone as planned, the Old Spaghetti Factory really is a great place to re-enact a moment from Lady and the Tramp. Just think more towards the end of the movie when they're trying to figure out how to feed all the puppies. This is the perfect place for that scene.